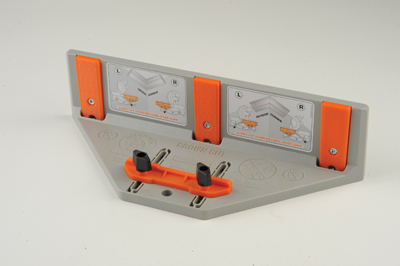 This is a very neat, easy to use and low cost jig for cutting crown mouldings or cornice, as we tend to call it in the UK. Made of tough plastic and adjustable to suit size variations it is designed for use with a standard compound mitre or chop saw. It allows the stock to sit at the correct 45Âº angle by adjusting the front orange stop and rear sliding supports. 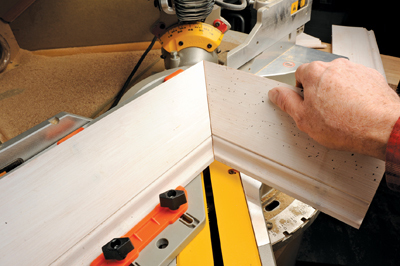 The trick you need to get your head around, whether you are cutting internal or external compound mitres or splicing lengths of moulding together, is that all cuts made in the jig must be upside down, which also means reversed left to right of course. Once you can figure that out, the process is plain sailing! It works, it's simple, just a bit of mental juggling required. The rear supports are held on short bolts and nuts, these do fall out easily so keep your finger over the nuts when you adjust each support. It should help to make a tricky job easier using this device.